The Sathya Sai School is a model school which provides students from Junior Kindergarten through Grade Six with an education that balances both academic excellence and character development. 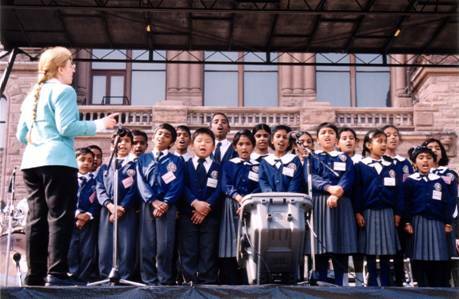 Inaugurated on September 2, 2000, the non-profit private school is open to all students regardless of socio-economic status, ethnic origin or religion. 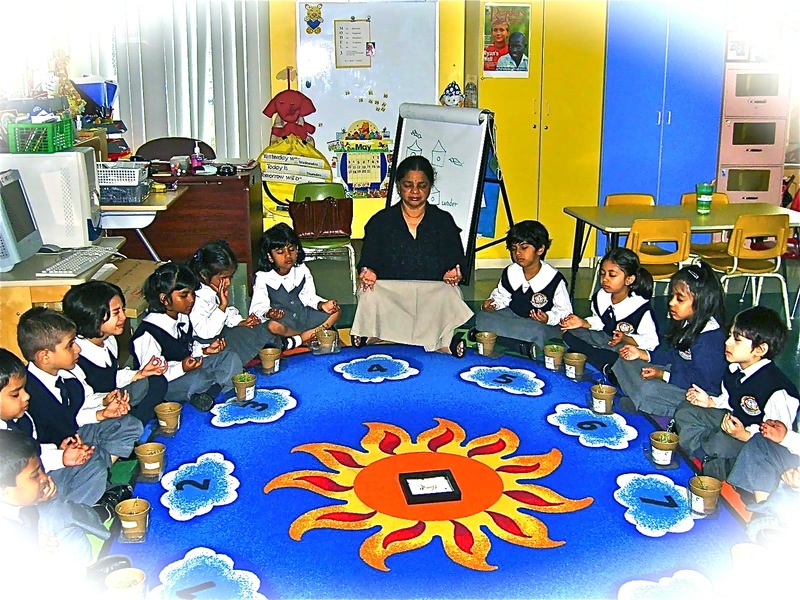 The school is inspired by the educational philosophy of Sathya Sai Baba called educare, which aims at developing each child’s potential by drawing out the infinite intelligence and goodness latent in every individual through emphasis on the human values of Truth, Right Conduct, Peace, Love, and Nonviolence. This educational approach employs a variety of effective teaching methods structured around the five human values, including daily light meditation, discussion of the values, yoga, and community service activities. Specially trained teachers (who are multi-cultural and multi-faith) further integrate the human values within the learning of traditional academic subjects such as math, science, language, social studies and physical education. There are over 120 such schools around the world. 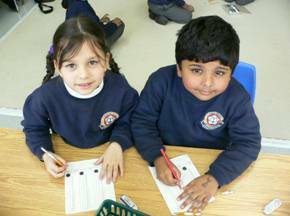 Sathya Sai School has become one of the most prominent schools in Canada, with its students excelling in their academic achievement. 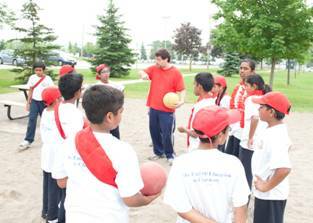 For the past six years, the Sathya Sai School has been ranked among the top elementary schools in Ontario by the Fraser Institute. In the Fraser Institute’s 2011 Report Card on Ontario Elementary Schools, the Sathya Sai School was rated the # 1 school out of 2,733 in the Province of Ontario. 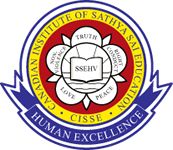 On November 24, 2011, at the Fraser Institute’s annual Awards for Excellence in Education, awards were given in three categories and the Sathya Sai School was named the winner of the Award for Excellence in Language Arts and the 2nd Runner-up of theAward for Excellence in Mathematics. 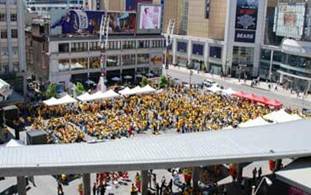 The Fraser Institute based its ratings on the province-wide Ontario Ministry of Education’s four-day EQAO exams taken by grades 3 and 6 for the preceding five years. The motto of the school is “The end of education is character”. These words of founder Sathya Sai Baba have become the motivating force to encourage selfless service by the students in all aspects of their lives: the family, the community, and the world. Children are encouraged to extend whatever they learn at school to the family, by learning to be responsible and helpful. Parents are required to attend Dynamic Parenting Workshops to learn how to apply human values to improve family life. Students are encouraged to participate in community service projects that provide an opportunity to practice the values they are learning. In this way they share with the less fortunate or suffering members of our community, such as seniors, the homeless, and the hungry. They are also encouraged to care for the environment through participation in park cleanups, saving energy, etc. Students are motivated to show compassion beyond their own borders by responding/providing service in response to various world crises such as wars, earthquakes, and floods and by adopting foster children from Indonesia and Senegal. 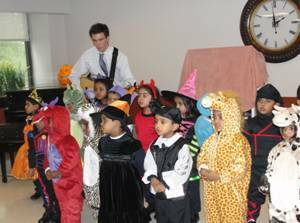 Group Activities: Conducting role plays, attitude tests, discussions and creative work that teach students how to work and play together in a harmonious way. Students develop responsible citizenship through community service projects. The Children Helping Children project allows children to practice self-sacrifice by donating self-earned money to programs for needy children around the world, such as providing money for our adopted children and contributing to the Ryan’s Well Foundation to build wells in Africa. Participating in the Serving Charity/Children for Charity program gives children the opportunity to make sandwiches for the homeless and provide them with clothing and blankets. 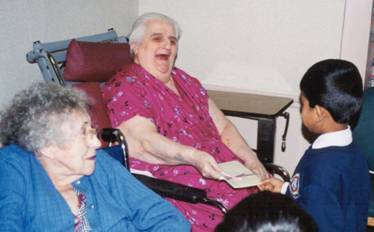 Singing at seniors’ homes offers students the opportunity to share love and compassion with the elderly. 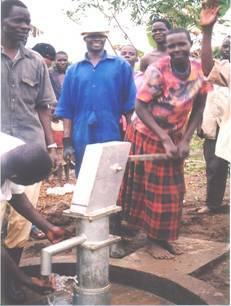 Sathya Sai School’s well called Ayugi in Ocini Parish, Uganda serves 700 people. 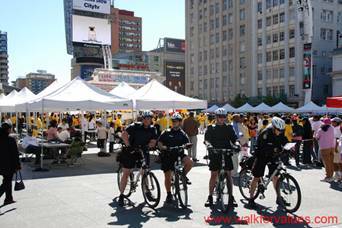 Walk for Values is a yearly non-fund-raising walkathon, which promotes the building of a “community of character”. 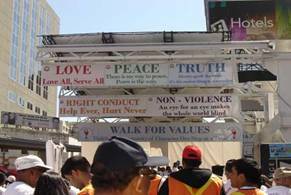 Each participant is requested to “Walk the Talk” by practicing human values thus fostering truth, right conduct, peace, love, and nonviolence. 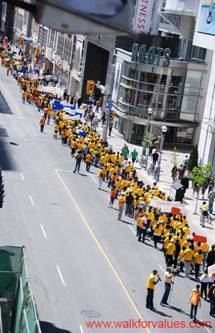 Started by the Sathya Sai School in 2003 in Toronto, it has become a na­tional and international event, with Walks being conducted in various cities across Canada, the USA, and around the world. who want to make a difference by practicing values. public schools and community groups with their respective banners.